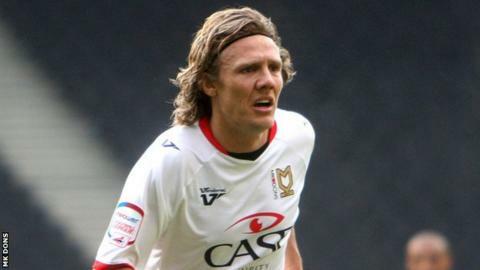 MK Dons midfielder Jimmy Bullard has retired at the age of 33. The former Wigan, Fulham, Hull and Ipswich player suffered two cruciate knee ligament injuries during his career and has decided to quit the game after seeing a specialist. He joined the Dons in the summer on a short-term deal and featured three times for the League One club. "My old knee injury has never allowed me to get back to where I want to be as a football player," he said. "It's always hindered me. There are a lot of games in this league and I now know my knee won't allow me to play Saturday-Tuesday-Saturday-Tuesday. It's not built for that now. "I want to be out there playing but at the same time I know my knee won't allow me to play at my best and to keep my place in the team. I'm hindering myself more than I am helping myself for the future." Bullard made his senior debut at Peterborough United in August 2001 and went on to play 312 league games for six different clubs, scoring 39 goals. His career was severely hampered by injuries, most notably when he ruptured the cruciate ligaments in his knee twice in three years, firstly at Fulham in 2006 and then on his Hull debut in 2009. He joined Ipswich 21 months ago, initially on loan and then permanently after having his contract terminated at Hull. But injuries and a disciplinary breach, which saw him and team-mate Michael Chopra hindered his spell at Portman Road and he signed for Karl Robinson's Dons in August. "In the summer I knew I wanted to give it one last crack and show people what I could do," he added. "But what I think with my strong head and what I could physically do are two different things. My head tells me I can do it, but my body tells me, no Jim, you can't."